A sermon preached by Rev. David M. Crawford at Rundle Memorial United Church, Banff, November 6, 2011; part of a sermon series on our stained glass windows. Based partially on Matthew 28:16-20. So today we come to the end of our 6-part series on our stained glass windows. 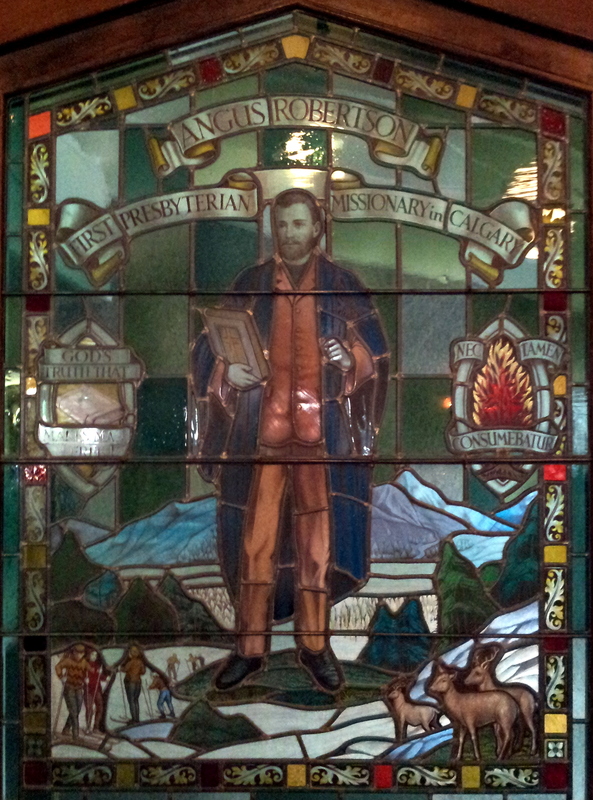 For those visiting today, we began with the John Wesley window, then moved on to John Calvin, Isaac Watts, and local missionaries Astor Schrag (Congregational), Robert Rundle (Methodist), and today Angus Robertson (Presbyterian). My aim throughout this sermon series has been to share a little history of the people portrayed in these windows, explore why they were chosen, and then seek to discern how their witness of centuries past might serve as an example for us today. So finally we come to Angus Robertson, poor Angus, stuck in dark corner of the sanctuary, rarely truly seen. Yet his service to God may be seen as a beacon of light, of sorts, not only for our ancestors settling into Alberta in the late 19th century, but also for us. Angus Robertson arrived in Calgary about three months before the railway did, in June of 1883. He was 26 years of age, fresh out of seminary, Knox College in Toronto. The Knox College Monthly had printed a challenging ad a few months prior concerning mission work in the West, stating: “Strong men are needed for this work – men of strong physique, of strong faith of strong personality.” Such a man was Angus Robertson. He started working almost immediately. The very first issue of the Calgary Herald on August 31, 1883 reported that the Presbyterian Mission had begun meeting in the Hudson’s Bay store as well as in the hospital of the NWMP. But soon Robertson would lead the charge to build a church, which was finished and open for worship in October. Robertson was an ecumenically-minded minister at a time when ecumenism wasn’t yet popular. He worked especially well with the Methodists. Rev. James Turner was a Methodist missionary and colleague of Robertson’s. Numerous times both the Presbyterians and Methodists joined together for worship, for Sunday School, and to support worthy causes. Angus Robertson pushed for a cemetery to be built in the young town. In Calgary, up to the time of Robertson’s arrival, all were buried in the Roman Catholic cemetery and there were no other options. Robertson convinced politicians to select a location for what became Union Cemetery, and strangely enough, sadly, he himself became the first person buried at Union just six years later, following his death from Typhoid. In going to Donald Angus received the bare minimum in stipend. It was a posting no one else wanted, a rough, frontier, railway town. Robertson went to this inhospitable place, ministered to the settlers and transients, performed weddings and funerals, presided over the sacraments, and promoted, as best he could, the kingdom of God in that place. He got married in Donald, had two children, and abruptly died there too, at the age of only 33. What strikes me about his story is the fervor with which he pursued his service to God – first venturing into the unknown territory of a young Calgary, then taking up the challenge of going into the extremely hostile territory of Donald. , B.C. “Go, therefore, and make disciples of all nations…” Sometimes called The Great Commission, its origins debated by Bible scholars, nonetheless a rallying cry for the task of evangelism, sharing the faith for centuries. Recall that when Jesus uttered these words, there were no clergy, as such. Followers were followers and all were summoned to “go” and “make”. I wonder to what extent we still hear the personal summons in these words, or don’t? To what extent we perceive the job of evangelism to be ours and not someone else’s, like the minister? You remember Luther’s popular Reformation phrase “the priesthood of all believers”? Are there opportunities afforded us in our daily walk, to speak of our faith, to take a stand for some moral principle, to invite someone to worship? Evangelism may be out of step with our culture’s values — a so-called “tolerant” society may not react well to attempts at what might be called proselytizing. otherwise known as sharing faith. Yet what or who rules our lives – culture or God? Angus Robertson went into the unknown, hostile territory of Donald, B.C. with Gospel to share. Will we go as far as to raise the subject of faith in the well-known, friendly territory of our everyday lives? Then again, maybe the territory isn’t as friendly as I’m suggesting. Thoughts to ponder as we reflect on the church of our ancestors in the faith, and of course the church of our own time.